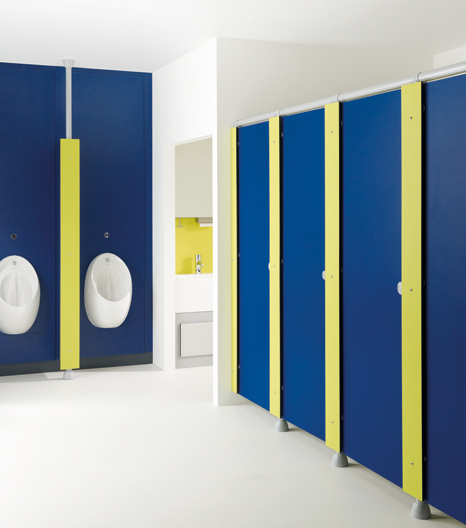 Steel-framed, anti-vandal, cubicle system for schools, with fail-safe emergency door release provided by removable pilasters with anti-tamper fixings. Material: High density, solid grade laminate (SGL) with decorative face each side. Edge treatment: All edges radiused and polished (black). Frame: High strength, galvanized steel pipe structure with light-grey UPVC sleeving, integral adjustable pedestal. Wall fixing: Continuous channel for partitions, light grey powder coating. Fixings: High strength, 'cubicle clamp' metal fixings with concealed dove-tail connection or dome headed anti-tamper fixings. Bolt: Rounded, high strength metal indicator bolt with emergency release and keep. Height: 2100 mm from FFL, including 100 mm floor clearance. Depth (maximum): 2000 mm from face of back wall or rear ducting. Consult Venesta Washroom Systems for details of colour range. Pilasters and doors are available with a digital print finish at extra cost. The product information below is from the NBS Plus library of product clauses offered in NBS specification products. It has been created by NBS for Venesta Washroom Systems Ltd. Each product clause is authored in NBS format and is intended for inclusion in project specifications. Please note that NBS product guidance is not a replacement for the manufacturer's literature and it is recommended that Venesta Washroom Systems Ltd be consulted before specifying.